The Cave of the Seven Sleepers In Paphos, Cyprus? One of the sweetest and most moving feasts of the Christian world is the Dormition of the Most Holy Theotokos, which the Church celebrates today. From the first century, there existed much honor and reverence that the Christians bestowed towards the Virgin Mary. But today's feast is the preeminent commemoration of the Theotokos, being her Dormition. 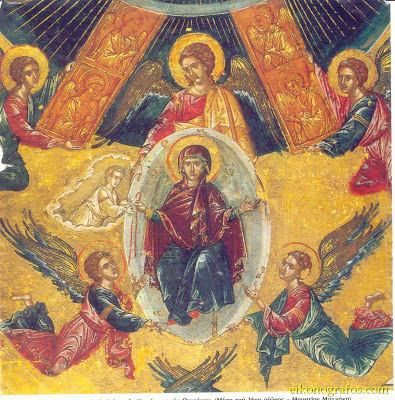 This Dormition took place, according to pious tradition, on the 15th of August, but over the passage of time, with the cultivation and growth of the Christian spirit, temperance was declared for fourteen days prior, in honor of the most-pure Mother of God. While conducting this fast, there are chanted in the sacred temples on alternate days, two most melodious Supplication Canons, the so-called Great Supplication and the Small. The latter has the signature "A Poem of Theosteriktos the Monk, or Theophanos," and probably is that of Theophanos, for it truly seems like the work of an expert poet, while the Great Supplication is a poem of Emperor Theodore Doukas Laskaris. Exiled from the Queen City, which was destroyed by the Latins, this unfortunate emperor, in his frailty pours out his complaints to its only patron and protector: "O pure one, unto whom else am I to flee? Where am I to run, where shall I be saved? Where shall I go, where else can I find a place of refuge, or fervent understanding, or a helper in times of need? In thee alone do I hope, my proudful boast and glory, therefore with boldness I fled to thee." Towards the end of the Great Supplicatory Canon those solemn exaposteilaria are chanted: "O ye Apostles from afar, being now gathered together, here in the place called Gethsemane, give burial to my body; and thou my Son and my God, receive Thou my spirit." The third entreaty on behalf of the faithful is deeply moving: "I have thee as Mediator with God who lovest mankind. May He not reproach my actions, before the hosts of the angels. I beseech thee, O Virgin, come speedily to my help." To this hymn is piously connected the doctrine from mouth to mouth which is carried and unbroken by Orthodox Christians, that at the Last Judgment, before the frightful decision of the impartial Judge, the merciful Mother and Virgin will raise her final hand of entreaty towards her Son and Lord, calling upon His condescension towards sinners. After the fortnight preparation and fast, the feast begins, which is followed by the post-feast, that is chanted until the 23rd of the month, when the apodosis of the feast is celebrated, otherwise known as the Metastasis of the Theotokos. But all of August is considered to be dedicated to the Mother of God, at sacred Athos, the acropolis of Orthodoxy, which after the fall of the Queen City received the relics and treasures not looted by the foreigners, and where above others is preserved and given singular honor and privilege the most exalted name of the Theotokos, where her post-feast continues after the 23rd of the month. For the sake of curiosity it may be noted the coincidence, that astronomically the month of August belongs to the so-called Virgin (Virgo) in the Zodiac. On this day of celebration the praises and hymns are among the most beautiful of the Church. Nothing loftier or more beautiful was written by Kosmas and John of Damascus, the two greatest composers of the Church, highlighted this day in the churches, and the Service of the Dormition of the Theotokos emulates the compositions of Holy Week and Christmas. Most lyrical is the divinely inspired Canon of the divine Kosmas, where the eirmos of the first ode in the first mode says: "Thy noble solemn memorial, O Virgin, adorned with divine glory, hath brought all believers together in rejoicing as Miriam did of old, coming forward with timbrels and dances, singing to thine only Son; for in glory hath He been glorified." The second troparion of this ode says: "Thou receivest many victorious trophies against nature, Pure One, having given birth to God, yet, imitating thy Maker and Son, thou didst supernaturally bow to the laws of nature, and having died thou didst rise and art with thy Son for eternity." The golden crown and conclusion of this entire Canon, are the most beautiful katavasies of the ninth ode, after the Megalynarion, which is also chanted in the Liturgy: "All the generations, will bless thee, the only Theotokos." "The bounds of nature art overcome in thee, O pure Virgin, for thou didst remain a Virgin in childbirth and didst betroth mortality to life. Remaining a Virgin after childbirth, and living after death, ever save thine inheritance, O Theotokos." Source: Published in the newspaper Ephemeris on August 15, 1887. Translated by John Sanidopoulos.